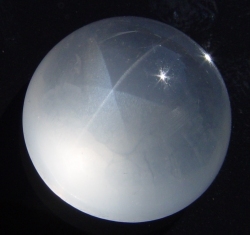 Against a dark background, and cut en cabochon, this variety of quartz will display a six-rayed star. These gems are often painted black on the back, or assembled with black onyx as a doublet to show of the star effect better. Star quartz is not enhanced. Star Quartz is a member of the Quartz gemstone family.